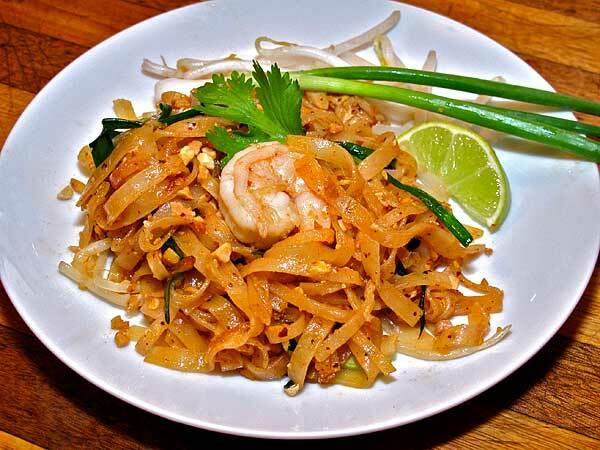 Many people who have not been to Thailand or who have not taken Kasma Loha-unchit’s cooking classes think that Pad Thai is the best of a small number of Thai noodle dishes. 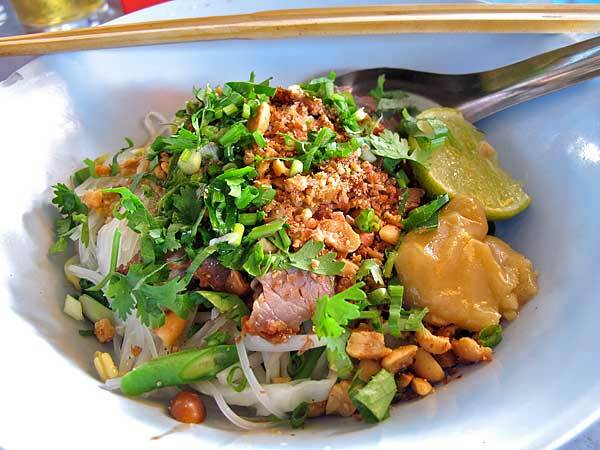 However, just as restaurants here in the U.S. serve a very small percentage of the Thai dishes available in Thailand, so do they short-change the incredible number of noodle dishes found in Thailand. 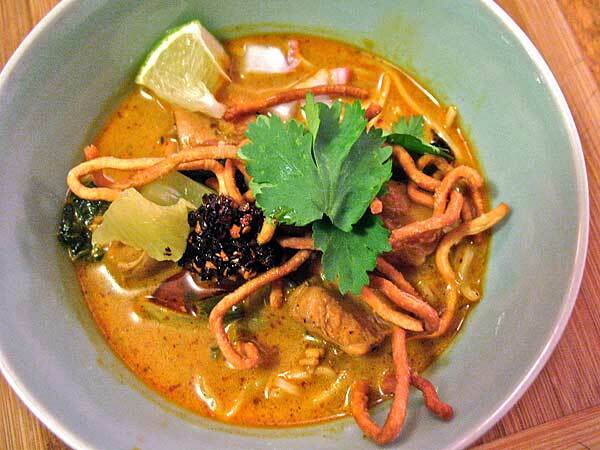 Here we highlight 28, just a fraction of the plethora of Thai noodle dishes available. 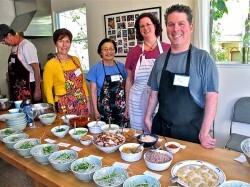 Many dishes shown here are nearly impossible to find in U.S. restaurants; the only way to taste them all is to find them in Thailand or take all of Kasma’s Thai cooking classes – Kasma teaches her version of virtually all of them somewhere in her Beginning, Intermediate and Advanced series classes. 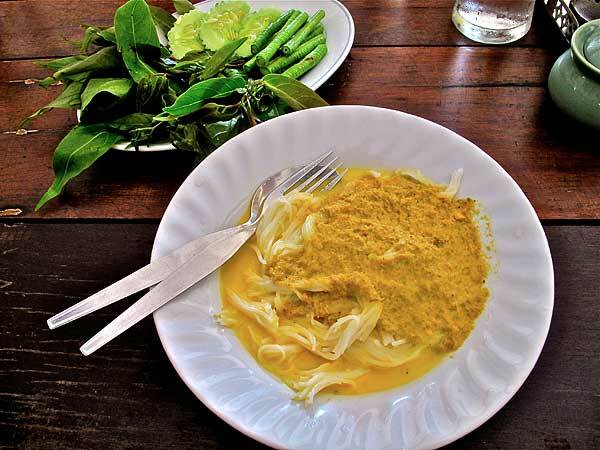 You’ll sample many on Kasma’s small-group tours to Thailand; often people who have gone on her trips come to take the classes so that they can make the unforgettable foods they ate during the trip. 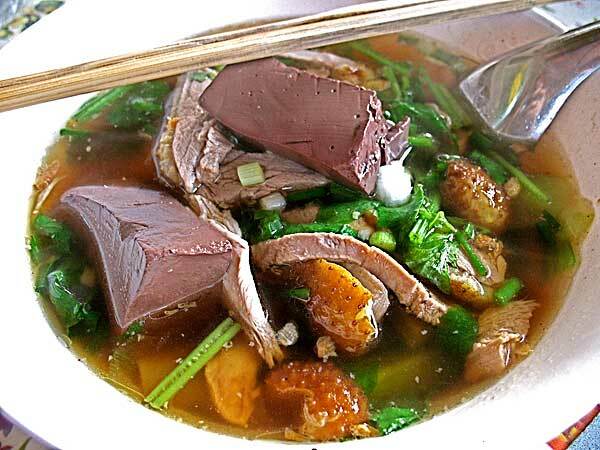 You may find that the same dishes may taste a bit different in Thailand. For instance, the noodles in the picture to the left are traditionally made from a fermented rice noodle that is difficult to find in western countries so the unfermented variety is substituted. 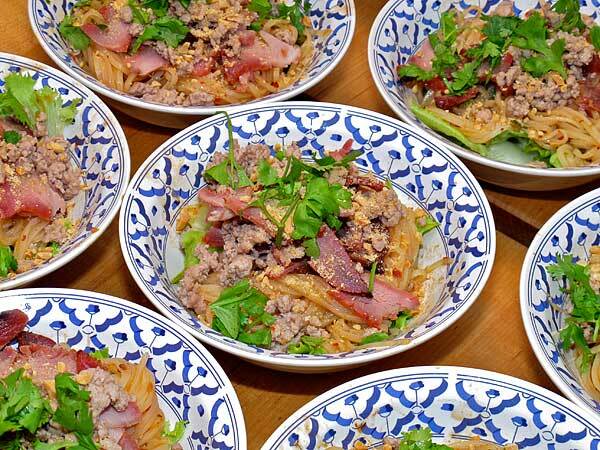 Just as with any Thai dish, any particular noodle dish varies with the cook so you’ll come across different versions as you travel in Thailand or learn to make your own versions from class. Look at the pictures and be prepared to get hungry! Please comment at the bottom of the page!! What is your favorite Thai noodle dish? What noodle dishes shown here look the most appetizing? What dishes here that are new to you do you want to try? Note: All pictures are Copyright by Kasma Loha-unchit & Michael Babcock. Click on any picture to see a larger version. There is a slide show of all images at the bottom of the page. To the left we see Roast Duck Noodles from my favorite duck noodle shop in Thong Lo (pronounced “tawng law” – Sukhumvit Soi 55). This dish uses what the Thais call บะหมี่ (ba mee) – egg noodles made with wheat. 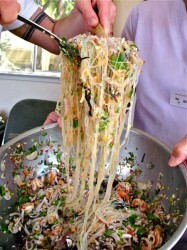 As with virtually all noodle dishes, they are assembled to order and then served. You’ll need to use the condiment set noodle shops have at the table to add sour, salty, sweet and (for me, at least) ground dried red chillies to add some heat. The bowl on the right is known in short as “Boat Noodles” – so-called because of the origin, being sold by vendor boats on the canals. 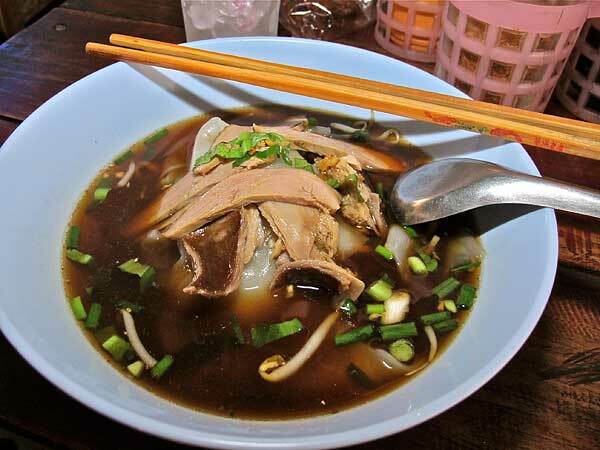 When you get ก๋วยเตี๋ยวเรือ (Kway Teow Reua), expect beef noodles in a rich beef broth, usually strengthened with beef blood and organ meats. This version here, from one of Kasma’s advanced cooking classes, includes tripe and tendons. Sometimes in the cities you’ll find a storefront noodle shop with a wooden boat outside to advertise that they make boat noodles. There are even shops where noodles are made to order with the cook sitting in a wooden boat just like he or she used to do on the canals before moving the operation onto dry land. This noodle dish usually uses wide, fresh rice noodles – ก๋วยเตี๋ยวเส้นใหญ่ (kway teow sen yai). 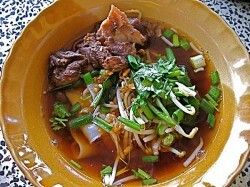 These two pictures of Stewed Beef Noodles show you how a noodle dish with the same name can vary from place to place. The bowl on the left is Stewed Beef Noodles had at a small roadside stall in rural Kalasin in northeastern Thailand (Isan) on one of Kasma’s Trip D. It includes beef balls (dumplings) and tendons (in the very center). The bowl on the right has the same name – ก๋วยเตี๋ยวเนื้อ (Kway Teow Neua) – and is from a Muslim noodle shop in Krabi (in the south) during Kasma’s Trip C. Every place makes noodles just a little bit differently. Check out Kasma’s blog Beef Noodle Soup. This is Kasma’s version of what she calls “Drunkard’s Noodles” – Spicy Stir-fried Rice Noodles with Chillies and Holy Basil – ก๋วยเตี๋ยวผัดขี้เมา (Kway Teow Pad Kee Mao). 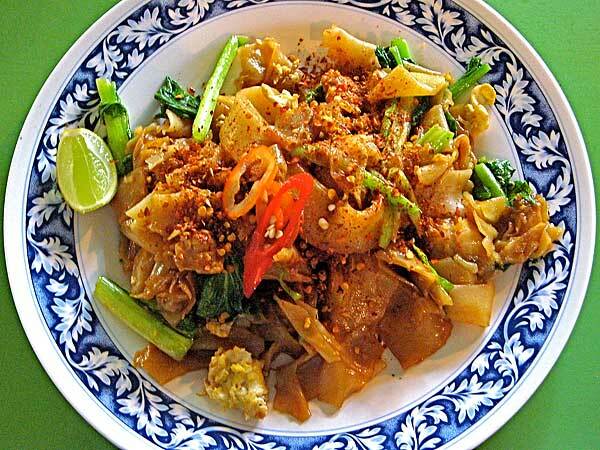 It is sometimes inaccurately called by some as “Drunken Noodles,” which implies the noodles are cooked with alcohol, when they are not; but the words ขี้เมา – kee mao – actually refer to a person who likes to drink or get drunk. It is so called because the noodles are made so spicy-hot that it makes you want to drink lots of beer (or rice whiskey/rum mixed with soda water over ice – popular among Thai men) to quench the heat. It’s a stir-fried dish with the wide, fresh rice noodles (ก๋วยเตี๋ยวเส้นใหญ่ – kway teow sen yai). When we cook it at home (I’ll cook it myself when Kasma’s away) we use ground pastured pork from the Berkeley Farmer’s market laden with a good amount of tasty fat. 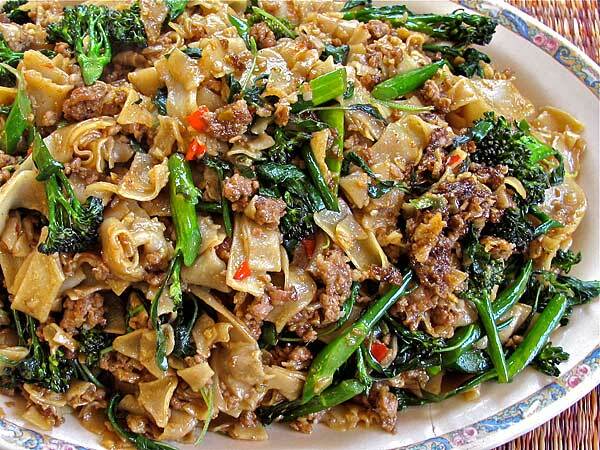 I’ve never found a good enough version of this noodle dish in Thai restaurants in the U.S. I’m always disappointed because invariably the restaurants here use Thai basil – ใบโหระพา (bai horapa) – instead of holy basil – ใบกะเพรา (bai kaprao) and it just doesn’t taste the same. They also never put enough Thai chillies to give the noodles the incendiary heat implied in its name. 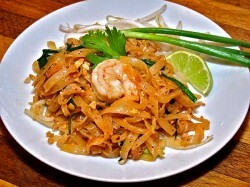 On the left is Pad Thai noodles, probably the single “Thai” noodle dish that everyone is familiar with. 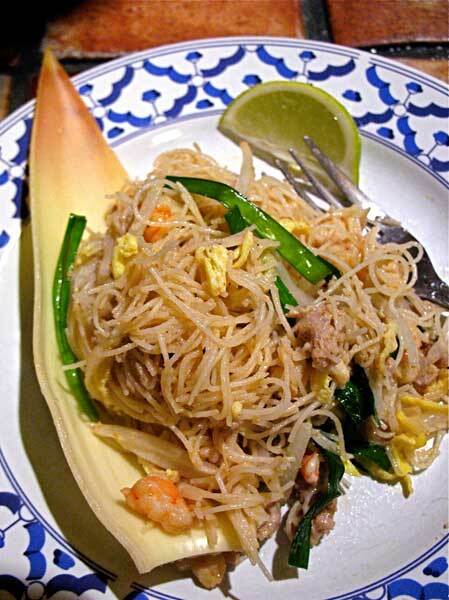 The name, meaning “stir-fried (pad) in the Thai style (Thai)” indicates that it is not really Thai in origin – see Kasma’s blog on The Origin and Making of Pad Thai. The dish on the right, ก๋วยเตี๋ยวราดหน้า (Kway Teow Rad Nah) could simply be called “Rice Noodles Topped with a Sauce.” It uses wide, fresh rice noodles – ก๋วยเตี๋ยวเส้นใหญ่ (kway teow sen yai) – and in this version, from one of Kasma’s cooking classes, the sauce includes chicken and Asian broccoli. It is best served piping hot and to taste really good, you’ll need to add some chillies soaked in vinegar (both chillies and vinegar, or at least some of the vinegar) to enhance the delicate flavors in the sauce. All noodle dishes in Thailand are served with a condiment set so that you can balance the flavors to your liking. See Michael’s blog on Thai Condiment Sets. 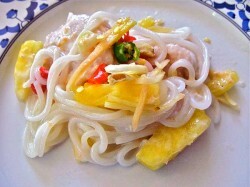 There are certain noodle dishes that are particular to a region or place. Kasma teaches the Spicy Ayuthaya-style Chicken Rice Noodles – ก๋วยเตี๋ยวไก่อยุธยา (Kway Teow Gai Ayuthaya) – in an Advanced cooking class – it is a hot-and-sour dish, made here with a pastured, free-range chicken, and uses daikon radish to add sweetness to the broth, garlic oil to add fragrance and pickled Thai chillies in vinegar to add the hot-and-sour flavors. It can be made either as soup or dry-style. 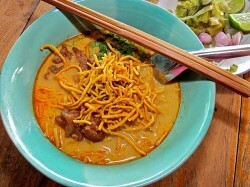 The Thai Muslim Curry Beef Noodles – ก๋วยเตี๋ยวแขก (Kway Teow Kaek) to the right is Kasma’s version of a dish from southern Thailand, where there is a large Muslim population. 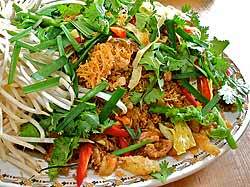 Rice noodles (in this version) or egg noodles are served in a rich, red curry sauce sprinkled with green onions, fried shallots, cilantro and coarsely ground dried shrimp and peanuts. Yum! Here are two versions of Khao Soi (ข้าวซอย), a northern Thailand curried noodle dish, rich and delicious. To the left we see Chiang Mai-Style Curry Noodles with Chicken and Condiments – ข้าวซอยไก่ (Khao Soi Gai) – from Kasma’s Advanced Set B weekend series. 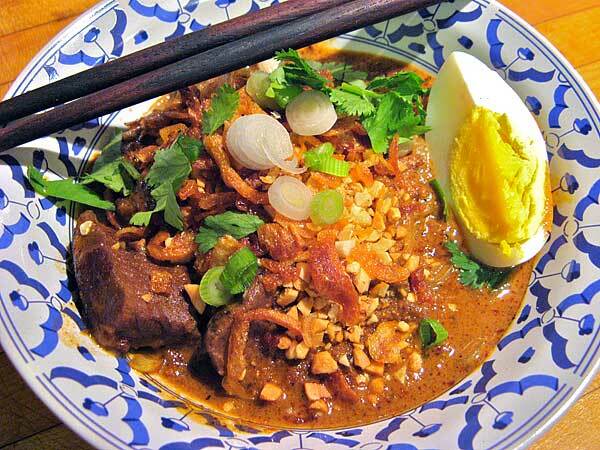 To the right we see the same dish made with beef – ข้าวซอยเนื้อ (Khao Soi Neua) – from a noodle shop in Lampang. 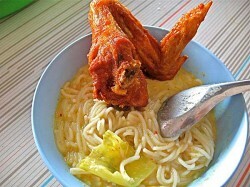 Soft, boiled egg noodles are topped with contrasting crispy fried noodles, which add an interesting crunch and texture. 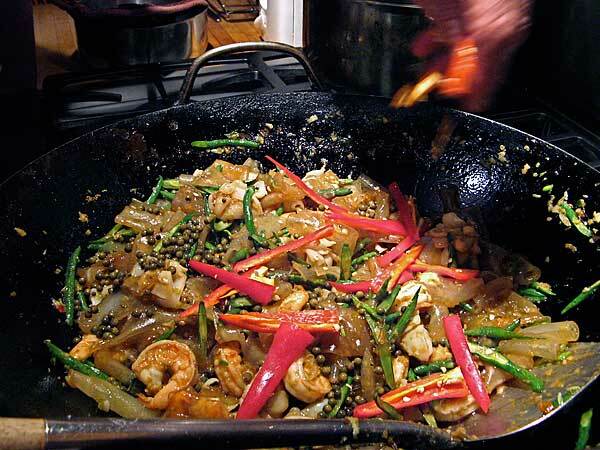 It is served with a plate of shallots and pickled vegetables, to be stirred into the noodles as desired, and lime wedges, to be squeezed in to add a sour flavor. It is also accompanied by fried chilli oil (visible in Kasma’s version to the left); the roasted, fried chillies add both heat and an interesting roasted flavor. Just be sure to taste the dish first! In Lampang I invariably forget that the dish is already fairly spicy/hot and after stirring in the chilli oil, it gets very hot indeed! See Kasma’s article on Northern Style Thai Noodles. To the left we see Stewed Duck Soup Noodles – ก๋วยเตี๋ยวเป็ดน้ำ (Kway Teow Bed Nam), a common soup noodle made in small noodle shops run by ethnic Chinese throughout the country. To the right is Kway Chap – ก๋วยจั๊บ – this particular bowl from a Mae Hong Son noodle shop near the morning market that’s run by ethnic Vietnamese Chinese who’ve settled in the area; it is made from flat rectangular or triangular rice noodles that curl into a tube when they are boiled. It is served in a rich pork broth that usually includes innards and congealed pork blood, which you can see in this bowl right in front of the spoon. Both these noodle dishes are Chinese-influenced and are flavored with either star anise or five-spice and often also with Asian cinnamon. Here are two versions of the southern-style ขนมจีนน้ำยา (Kanom Jeen Nam Ya) made with fermented rice noodles. ขนมจีน (kanom jeen), a round noodle a bit smaller than spaghetti, is perhaps the only kind of rice noodle in Thailand that is not Chinese in origin; they most likely originated with the Mon ethnic group, whose forbears ruled a large part of mainland Southeast Asia from the 8th to the 11th centuries before the Khmer empire rose to power. The yellow sauce is a fish-based sauce called น้ำยา (nam ya) and the southern Thai version is shown here. The photo on the left is from Krua Nakhon (now Wang Derm) Restaurant in Nakhon Si Thammarat in southern Thailand; it is served with a large platter of fresh and pickled vegetables and herbs (seen behind the plate), something that accompanies nearly all spicy meals in the south. The dish on the right is from a shop in a small town south of the city of Krabi, that makes its own fresh noodles from scratch with fermented rice dough as is traditionally done; they also serve a crispy and very delicious fried chicken which goes well with the spicy noodles. (We visit this shop on Kasma’s Trip A & C). 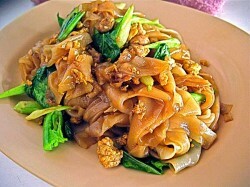 is another well-known Chinese-influenced Thai stir-fried noodle dish. It means, literally, “stir-fried with soy sauce.” Here are two versions. The picture on the left is taken at a small noodle shop south of Nakhon Si Thammarat, where we stop for a quick lunch on the way to Songkla on our Trip C. The second is taken on Poda Island (เกาะปอดะ – Koh Poda) in Krabi province, where the noodle is one of our breakfasts with a tour group; the noodle already has ground dried red chillies added from the ubiquitous condiment set at the table so that the diner can balance flavors as desired. 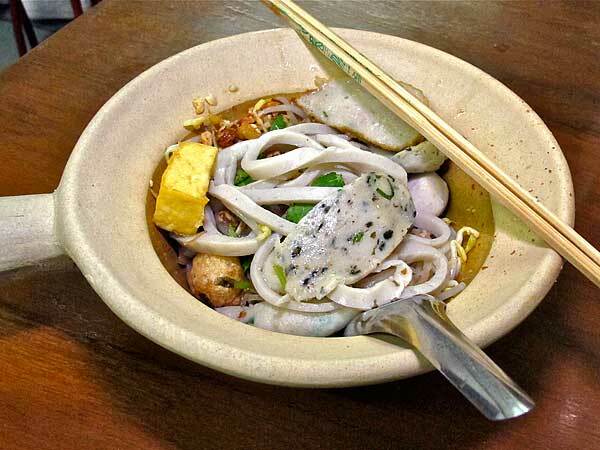 This dish uses wide, fresh rice noodles – ก๋วยเตี๋ยวเส้นใหญ่ (kway teow sen yai). 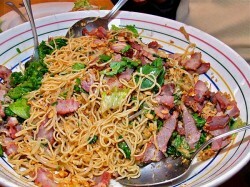 The Mee Krob (หมี่กรอบ – Glazed Crispy Noodles) to the left is from Kasma’s Intermediate cooking class.. Her version is less sweet than most and has a slight orange flavor from grated orange zest. 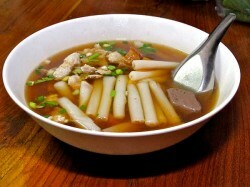 It uses the thin, dried rice-stick noodles- mei fun in Chinese and sen mee (เส้นหมี่) in Thai. The bowl to the right contains Rice Noodle Soup with Fish Dumplings and Pork – ก๋วยเตี๋ยวน้ำลูกชิ้นปลา (Kway Teow Nam Loogchin Pla) – from Damnoen Saduak Floating Market. These are two very different noodle dishes! Here are two pictures of the same Hot-and-Sour (Tom Yum) Soup Noodles – ก๋วยเตี๋ยวน้ำต้มยำ (Kway Teow Nam Tom Yum) – made on a boat at Damnoen Saduak floating market. The noodles are spicy/hot and sour, and include pork and shrimp dumplings. The bowl on the left is the bowl as it is served, fresh from the vendor; the bowl on the right is how it looks ready to eat, after the noodles have been stirred in. 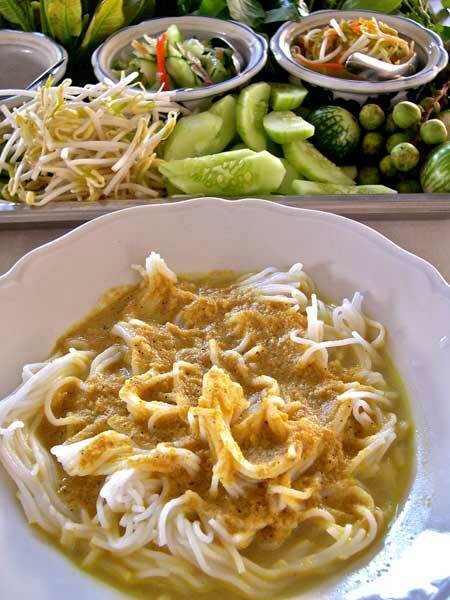 Skinny fresh rice noodles – ก๋วยเตี๋ยวเส้นเล็ก (kway teow sen lek) are used here. 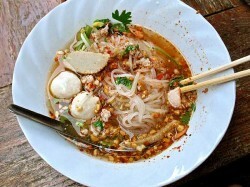 Like many noodles, tom yum (ต้มยำ – hot-and-sour) noodles can be served either as soup noodles (as with the two from Damnoen Saduak above) or dry. 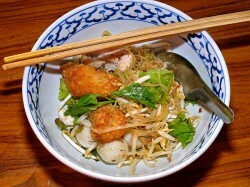 Here are two versions of tom yum haeng (ต้มยำแห้ง) – dry-style tom yum noodles. To the left is the Dry Hot-and-Sour Noodles with Fish and Fish Dumplings – เส้นเล็กต้มยำแห้งปลา (Sen Lek Tom Yum Haeng Pla) from a noodle shop in Hang Dong, Chiang Mai. To the right we see Hot-and-Sour Dry Rice Noodles with Pork – เส้นเล็กต้มยำแห้งหมู (Sen Lek Tom Yum Haeng Moo); it is Kasma’s version from her weekend Advanced Class C. Be warned, this noodle is a very spicy/hot dish! 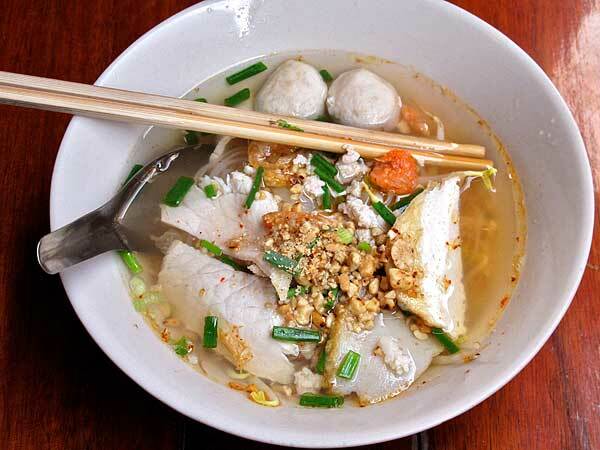 To the left is another bowl of soup noodles: Rice Noodle Soup with Fish Dumplings – ก๋วยเตี๋ยวน้ำลูกชิ้นปลา (Kway Teow Nam Loogchin Pla) – from a popular noodle shop on Sukhumvit Road near Thong Lo (pronounced “Tawng Law” – Sukhumvit Soi 55); Kasma’s small-group trips to Thailand go there for a noodle breakfast. The picture to the right shows the set-up in Kasma’s advanced set F-4 class to assemble Sukhothai-Style Dry Hot-and-Sour Rice Noodles – ก๋วยเตี๋ยวแห้งสุโขทัย (Kway Teow Haeng Sukhothai). All the fixings are laid out and ready to assemble. Two versions of the Sukhothai-Style Dry Hot-and-Sour Rice Noodles – ก๋วยเตี๋ยวแห้งสุโขทัย (Kway Teow Haeng Sukhothai) are shown here from different noodle shops in Sukhothai province; every shop makes it just a little bit different. This is a delicious noodle dish – hot, sour and sweet with various goodies (pork cracklings, peanuts and more) to add texture as well as flavor. 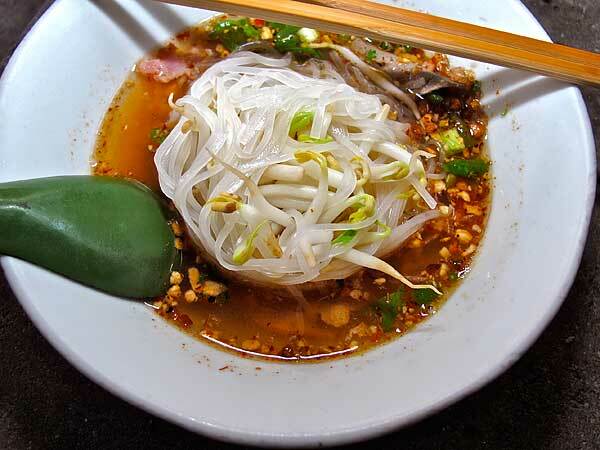 It has become a favorite noodle dish among many of Kasma’s trip members, easily surpassing Pad Thai as the best-tasting Thai noodle dish they’ve ever had. It’s very important to get just the right balance of flavors. Notice the lump of palm sugar in each bowl: this is something I’ve seen in no other noodle dish (which doesn’t mean there aren’t other dishes that use it). Before eating, everything is tossed together well, dissolving the palm sugar and mixing it in with the lime juice and other seasonings. To see more pictures, check out our Facebook album on Sukhothai noodles. The dish shown in these two pictures uses mung bean sheet noodles, which Thais call “Shanghai noodles” – ก๋วยเตี๋ยวเซี่ยงไฮ้ (kway teow Sianghai)) – made from mung bean starch (nowadays also mixed with potato starch) and water. 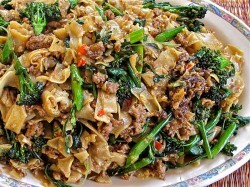 The brittle, dry sheet noodles are soaked to soften, then cut into bite-size rectangles for cooking. The pictures show Drunkard’s Stir-Fried Mung Bean Sheet Noodles with Shrimp and Cuttlefish – ก๋วยเตี๋ยวเซี่ยงไฮ้ผัดขี้เมา (Kway Teow Sianghai Pad Kee Mao). In the left picture it is being stir-fried in the wok during Kasma’s weekend Advanced Set G class; to the right, it is plated and ready to enjoy. 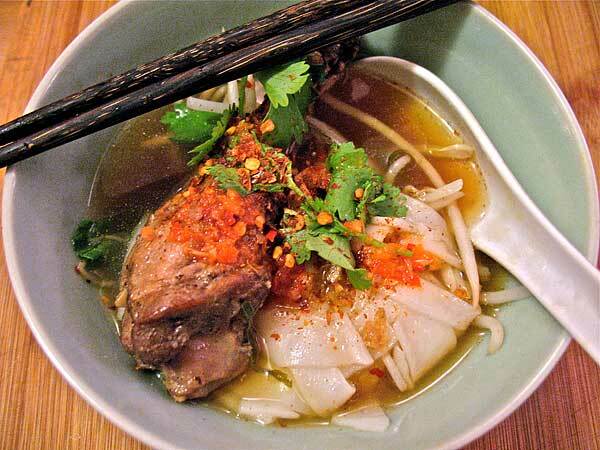 Here are two versions of Stewed Duck Noodle Soup – ก๋วยเตี๋ยวน้ำเป็ดตุ๋น (Kway Teow Nam Bed Doon). The bowl on the left is from Kasma’s weekend Advanced Set B Class. The bowl on the right includes duck blood and is from a noodle shop in the Sukhothai morning market. As before, you can see how dishes with the same name and mostly the same ingredients can vary. 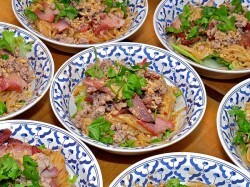 Noodles are also used to make dishes that accompany other dishes in a rice-based meal, in this case a yum (ยำ)-style salad – Thai-Style Bean Thread Salad – ยำวุ้นเส้น (Yum Woon Sen). It uses the bean thread noodles (วุ้นเส้น – woon sen), sometimes also called “cellophane” or “glass” noodles. They are made from mung beans though in this case they are extruded into thin threads rather than made into sheets like those used in the dish above. The first picture shows the salad being tossed in Kasma’s weekend Advanced Set H class and the second shows a close-up of the finished dish. 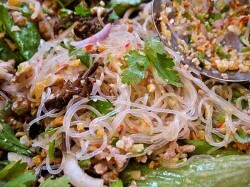 On the left is another example of a salad made with mung bean thread (วุ้นเส้น – woon sen) noodles. 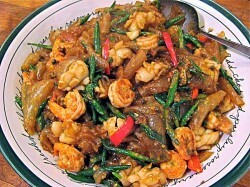 It shows Northeastern-Style Spicy Bean Thread Salad with Mint and Toasted Rice – ลาบวุ้นเส้น (Lahb Woon Sen) – from Kasma’s weekend Advanced Set B class.Like a lot of northeastern Thai salads, it is spicy/hot from lots of ground, roasted dried Thai chillies; ground, toasted rice adds another dimension to this salad. 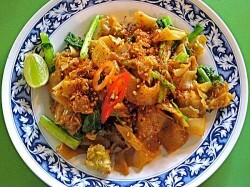 The picture on the right shows a very different type of kanom jeen (ขนมจีน) noodle dish from the spicy southern Kanom Jeen Nam Ya (ขนมจีนน้ำยา) pictured further above. This dish is Spicy Rice Vermicelli Salad with Pineapple, Ginger and Coconut-Lime Sauce – ขนมจีนซาวน้ำ (Kanom Jeen Sao Nam), which originated in Bangkok to serve at room temperature during the hot months of the year. The version here is from Kasma’s weekend Advanced Set C class. Kasma’s weekend Advanced Set C class. It is served with banana blossom, which, by itself, has a very astringent flavor, but when chewed along with the noodles, the astringency becomes hidden by the richness of the coconut cream. Mee Kati is an excellent complement to the blossom and through some mysterious alchemy the two tastes marvelous together. And last, but not least, is a dish that Kasma teaches in both her weekend Beginning series. 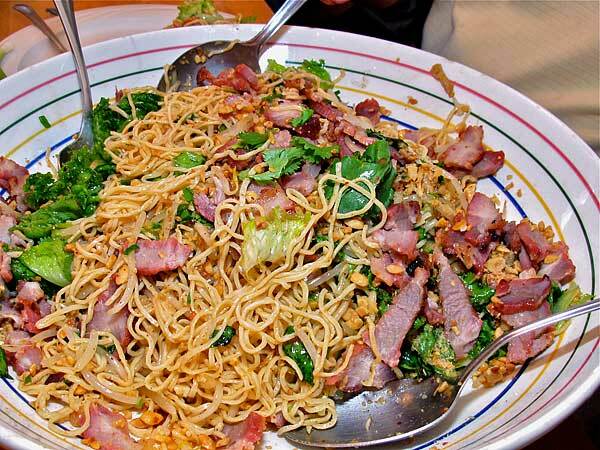 She calls it Garlic Noodles with Barbecued Red Pork (Thai-Style Pasta Salad) – บะหมี่แห้งหมูแดง (Ba Mee Haeng Moo Daeng), and it’s become a favorite among many of her students. 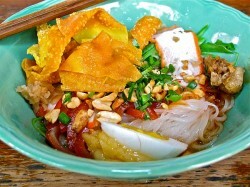 It uses บะหมี่ (ba mee) egg noodles made with wheat and has a delightfully mellow garlic flavor. This is a dish that can be served warm, at room temperature, or even cold out of the refrigerator, which make it perfect for potlucks. I made it for a potluck quite soon after I first took Kasma’s beginning series, two decades ago; the people at the party devoured it quickly and it was the first dish to disappear. I hope that you’ve enjoyed this brief survey of some of the noodle dishes that Thailand has to offer. Hopefully you’ll get a chance soon to sample some of the ones that are new to you – though you may need to travel to Thailand or come here to Oakland, California and take a few classes to do so! or click “Next” for the next slide. Southern-Style Rice Vermicelli Topped with Spicy Fish Namya Curry Sauce - ขนมจีนน้ำยา (Kanom Jeen Nam Ya) - from Wang Derm Restaurant in Nakhon Si Thammarat. 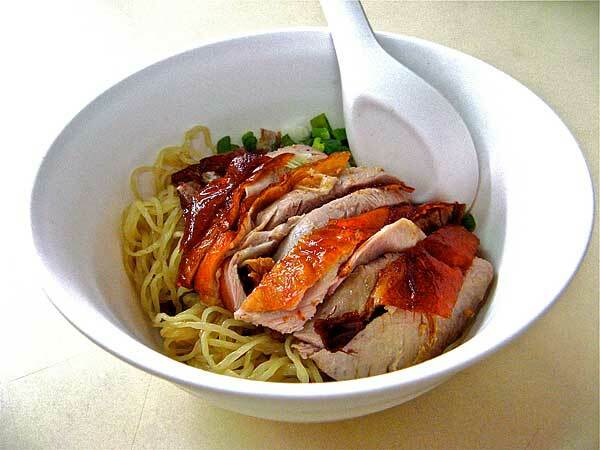 Egg Noodles Topped with Roast Duck – บะหมี่เป็ดแห้ง (Ba Mee Bed Haeng) - from a noodle shop on Thong Lo (pronounced "Tawng Law" - Sukhumvit Soi 55). 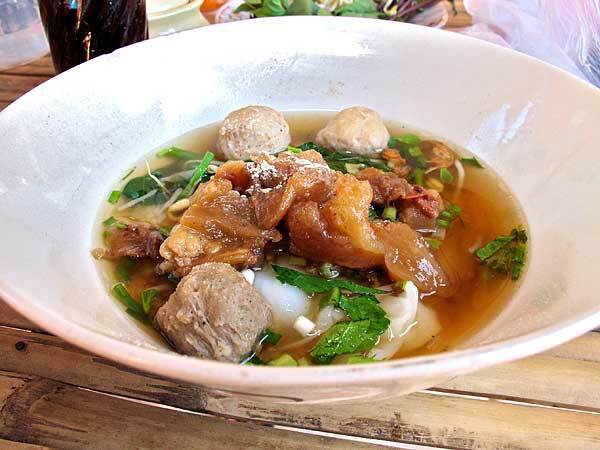 Stewed Beef Soup Noodles with Tripe and Tendons – "Boat Noodles" - ก๋วยเตี๋ยวเรือ (Kway Teow Reua) - from Kasma's Weekend Advanced Set C.
Stewed Beef with Tendons and Beef Ball Soup Noodles - ก๋วยเตี๋ยวเนื้อ (Kway Teow Neua) - at a noodle shop near the Sirindhorn Dinasaur Museum in Kalasin, northeastern Thailand (Isan). 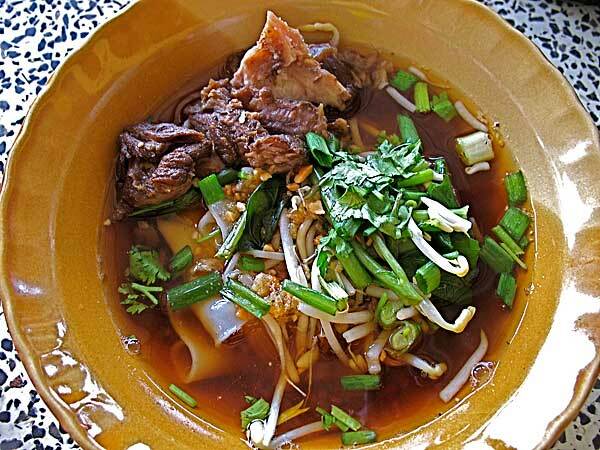 Stewed Beef Soup Noodles - ก๋วยเตี๋ยวเนื้อ (Kway Teow Neua) - from a Muslim noodle shop near Ao Nang in Krabi. Spicy Stir-fried Rice Noodles with Chillies and Holy Basil - ก๋วยเตี๋ยวผัดขี้เมา (Kway Teow Pad Kee Mao) - cooked by Kasma for her own enjoyment! 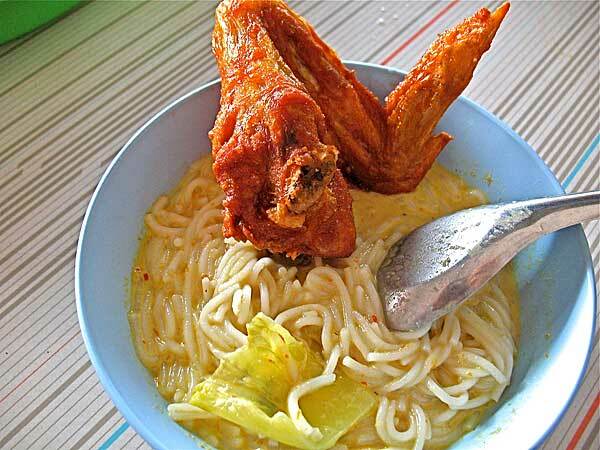 This is my favorite noodle dish. It MUST be made with holy basil (bai kaprao) and it MUST be very, very spicy. "Thai-style" Stir-fried Noodles - ผัดไท (Pad Thai) - from Kasma's 4th Beginning Evening Class. Pan-Fried Fresh Rice Noodles Topped with Chicken and Asian Broccoli Sauce - ก๋วยเตี๋ยวราดหน้า (Kway Teow Rad Nah) - from Kasma's Beginning evening Series (class #4). Spicy Ayuthaya-Style Chicken Rice Noodles (Soup) - ก๋วยเตี๋ยวไก่อยุธยา (Kway Teow Gai Ayuthaya) - Kasma's version from her weekend Advanced Set G class. Thai Muslim Curry Beef Noodles - ก๋วยเตี๋ยวแขก (Kway Teow Kaek) - This is from Kasma's weekend Advanced Set D.
Stewed duck Soup Noodles - ก๋วยเตี๋ยวเป็ดน้ำ (Kway Teow Bed Nam) - from a noodle shop in Udon, northeastern Thailand (Isan). 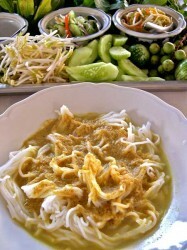 Kway Chap - ก๋วยจั๊บ - from a restaurant near the morning market in Mae Hong Son. Chiang Mai-Style Curry Noodles with Chicken and Condiments - ข้าวซอยไก่ (Khao Soi Gai) - from Kasma's Advanced Set B weekend series. Chiang Mai-Style Curry Noodles with Beef and Condiments - ข้าวซอยเนื้อ (Khao Soi Neua) - from a noodle shop in Lampang. 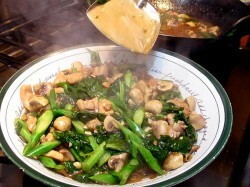 The vegetables on the back plate are stirred into the noodles as desired. Southern-Style Rice Vermicelli Topped with Spicy Fish Namya Curry Sauce - ขนมจีนน้ำยา (Kanom Jeen Nam Ya) - from Krua Nakhon (now Wang Derm) Restaurant in Nakhon Si Thammarat. Southern-Style Rice Vermicelli Topped with Spicy Fish Namya Curry Sauce - ขนมจีนน้ำยา (Kanom Jeen Nam Ya) - from a shop in Krabi province that makes their own Kanom Jeen rice noodles on the premises and serves it with delicious fried chicken. Stir-fried Rice Noodles with Soy Sauce - ก๋วยเตี๋ยวผัดซีอิ๊ว (Kway Teow Pad Si-ew ) - from Nakhon Si Thammarat. Stir-fried Rice Noodles with Soy Sauce - ก๋วยเตี๋ยวผัดซีอิ๊ว (Kway Teow Pad Si-ew) - from Poda Island (Koh Poda) in Krabi. Glazed Crispy Noodles - หมี่กรอบ (Mee Krob) - Kasma teaches this in her Intermediate weekend Series; her version is less sweet than most. Rice Noodle Soup with fish dumplings and pork - ก๋วยเตี๋ยวน้ำ (Kway Teow Nam) - from Damnoen Saduak Floating Market. Hot-and-Sour (Tom Yum) Soup Noodles - ก๋วยเตี๋ยวต้มยำ (Kway Teow Tom Yum) - from Damnoen Saduak Floating Market. Dry Hot-and-Sour Noodles with Fish and Fish Dumplings - เส้นเล็กต้มยำแห้ง (Sen Lek Tom Yum Haeng) - from a noodle shop in Hang Dong, Chiang Mai. 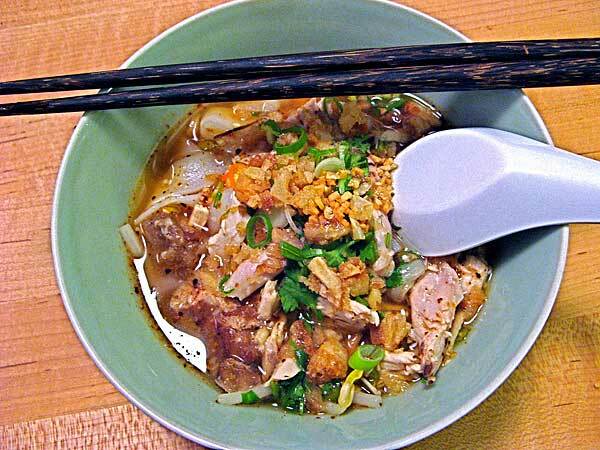 Hot-and-sour Dry Rice Noodles with Pork - เส้นเล็กต้มยำแห้ง (Sen Lek Tom Yum Haeng). This photograph is from Kasma's Advanced Class C-1. Rice Noodle Soup with Fish Dumplings - ก๋วยเตี๋ยวลูกชิ้นปลา Kway Teow Look Chin Pla) - from a noodle shop on Sukhumvit Road near Thong Lo (pronounced "Tawng Law" - Sukhumvit Soi 55). 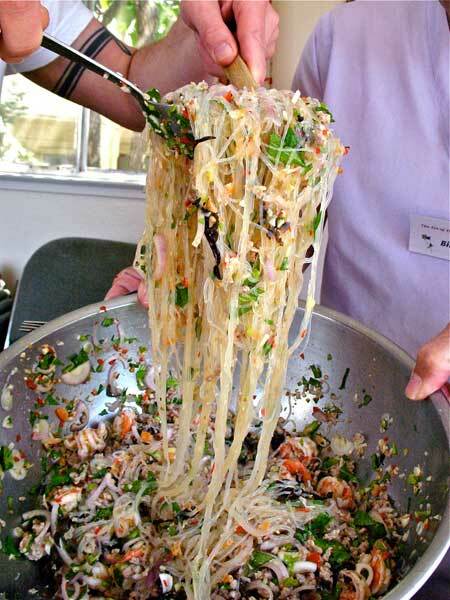 Sukhothai-Style Dry Hot-and-Sour Rice Noodles - ก๋วยเตี๋ยวแห้งสุโขทัย (Kway Teow Haeng Sukhothai) - students in Kasma's Weeklong Advanced Set D have the fixings for Sukhothai noodles laid out and ready to assemble. Sukhothai Noodles - ก๋วยเตี๋ยวแห้งสุโขทัย (Kway Teow Haeng Sukhothai) - from a noodle shop in Si Satchanalai in Sukhothai province. Sukhothai-Style Dry Hot-and-Sour Rice Noodles - ก๋วยเตี๋ยวแห้งสุโขทัย (Kway Teow Haeng Sukhothai) - from a noodle shop in Sukhothai. Drunkard's Stir-Fried Mung Bean Sheet Noodles with Shrimp and Cuttlefish - ก๋วยเตี๋ยวเซี่ยงไฮ้ผัดขี้เมา (Kway Teow Sianghai Pad Kee Mao) - shown in the wok during Kasma's weekend Advanced Set G class. Drunkard's Stir-Fried Mung Bean Sheet Noodles with Shrimp and Cuttlefish - ก๋วยเตี๋ยวเซี่ยงไฮ้ผัดขี้เมา (Kway Teow Sianghai Pad Kee Mao) - the finished dish from Kasma's Advanced Set G weekend class. 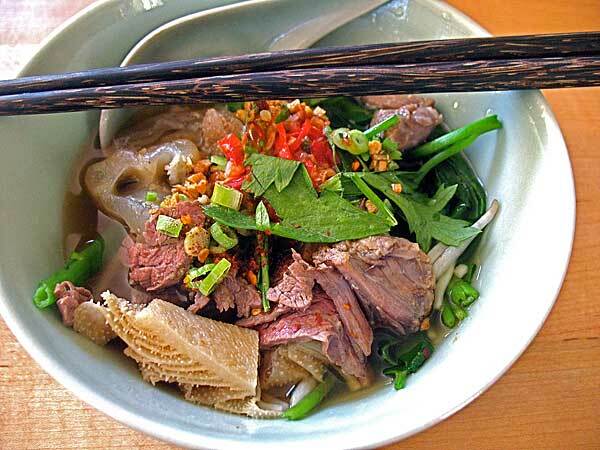 Stewed Duck Noodle Soup - ก๋วยเตี๋ยวน้ำเป็ดตุ๋น (Kway Teow Nam Bed Doon) - from Kasma's weekend Advanced Set B.
Stewed Duck Soup Noodles - ก๋วยเตี๋ยวน้ำเป็ดตุ๋น (Kway Teow Nam Bed Doon) - with duck blood, from a noodle shop in the Sukhothai morning market. Thai-Style Bean Thread Salad - ยำวุ้นเส้น (Yum Woon Sen) - being tossed in Kasma's weekend Advanced Set H class. 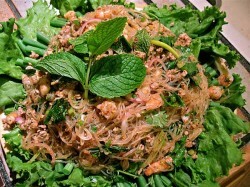 Thai-Style Bean Thread Salad - ยำวุ้นเส้น (Yum Woon Sen) - from Kasma's weekend Advanced Set H class. 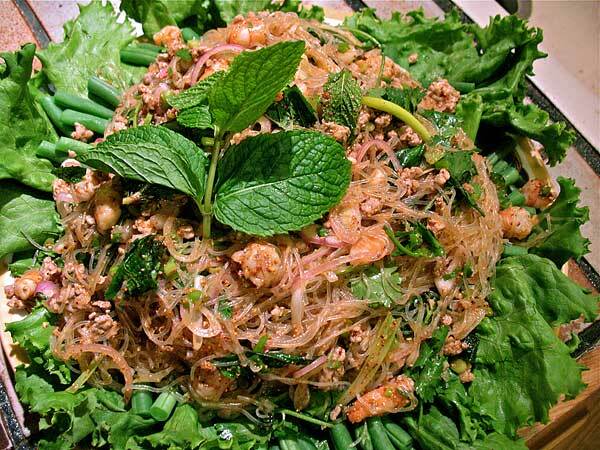 Northeastern-Style Spicy Bean Thread Salad with Mint and Toasted Rice - ลาบวุ้นเส้น (Lahb Woon Sen) - from Kasma's weekend Advanced Set B.
Spicy Rice Vermicelli Salad with Pineapple, Ginger and Coconut-Lime Sauce - ขนมจีนซาวน้ำ (Kanom Jeen Sao Nam) - From Kasma's weekend Advanced Set A. Rice Vermicelli Cooked in Spiced Coconut Cream Sauce - หมี่กะทิ (Mee Kati) - From Kasma's weekend Advanced Set C.
Garlic Noodles with Barbecued Red Pork (Thai-Style Pasta Salad) - บะหมี่แห้งหมูแดง (Ba Mee Haeng Moo Daeng) - Kasma teaches this dish in her Beginning weekend series.